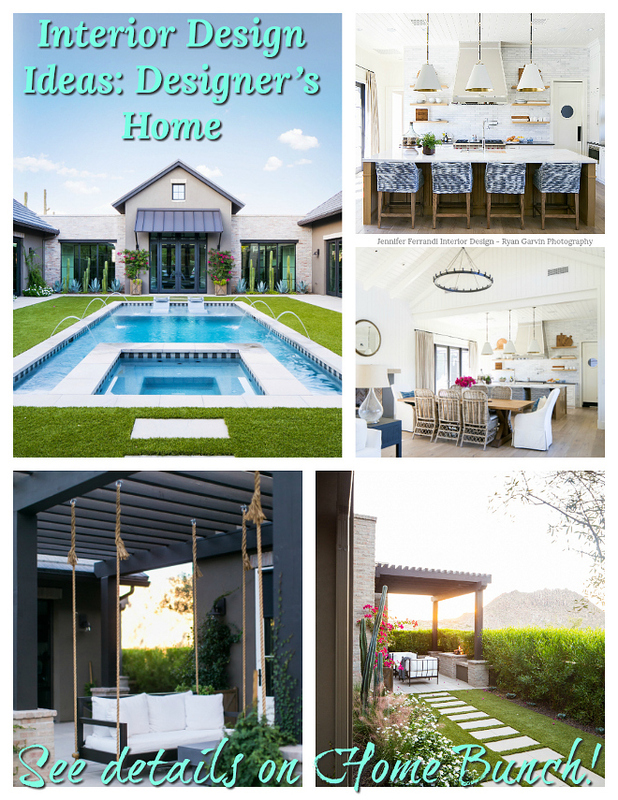 It’s that great time of the week again where we all come here to see a new “Beautiful Homes of Instagram” and “meet” a new homeowner. 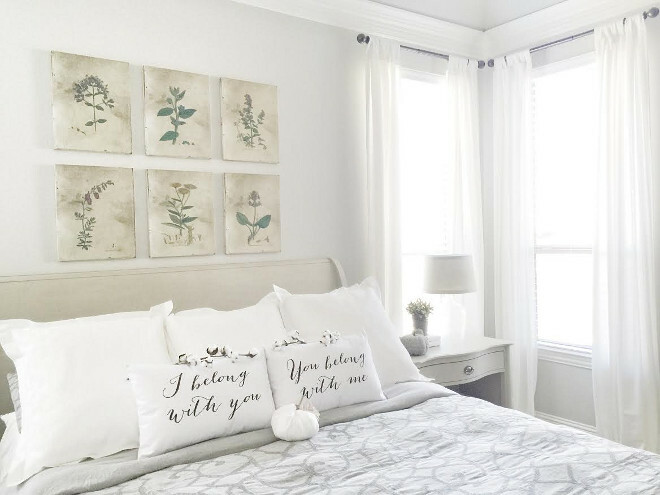 I keep getting emails from many readers and followers from Instagram asking me what they need to do to be featured on Home Bunch. 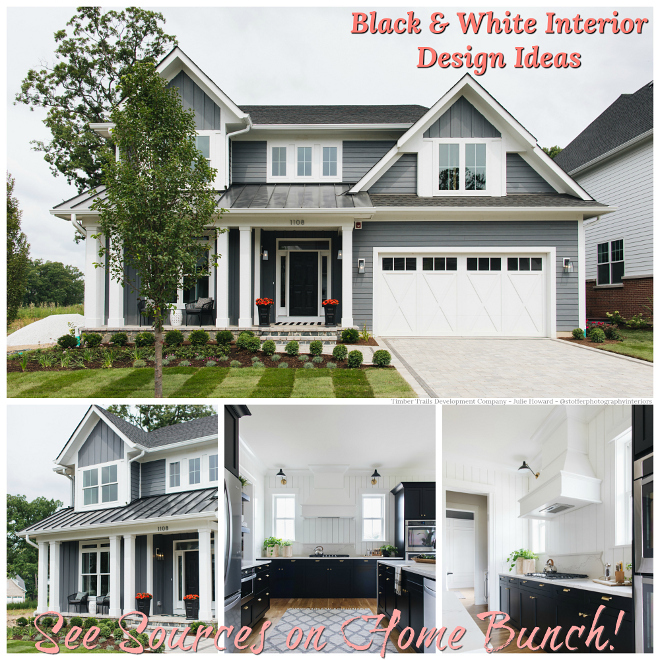 The best way to do it is by sending me an email so I can see your home or, like many times I do when I see a home I like, I approach the homeowner. The best part about this series is seeing that all of us, you and I, are very excited and enjoying each feature. 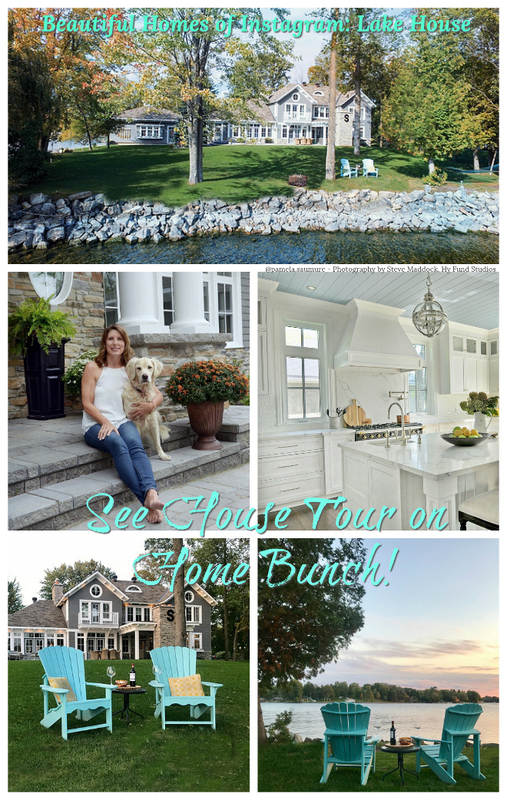 Getting to see these beautiful homes and getting to know these inspiring homeowners is incredibly fun. 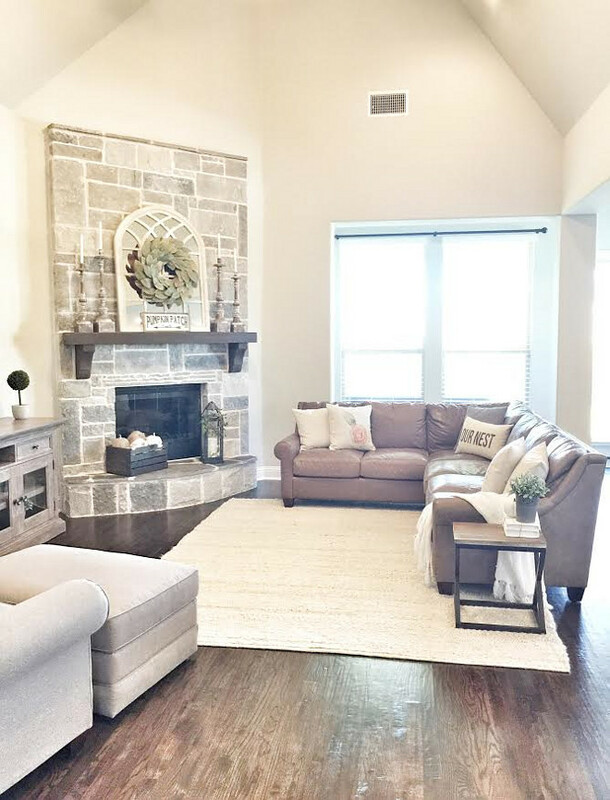 I love the fact that they are the ones who get their home ready, take the pictures and send all of the information about each space to me so I can share it all with you here. This series really showcases how their home really is, without being staged, without any fancy camera nor special filters. This is real people opening their doors and sharing their experience with us and telling us how they are living in the real world, and there isn’t a better kind of interior in my opinion. Today, I am happy and honored to have Callie from @ceshome6 with us. 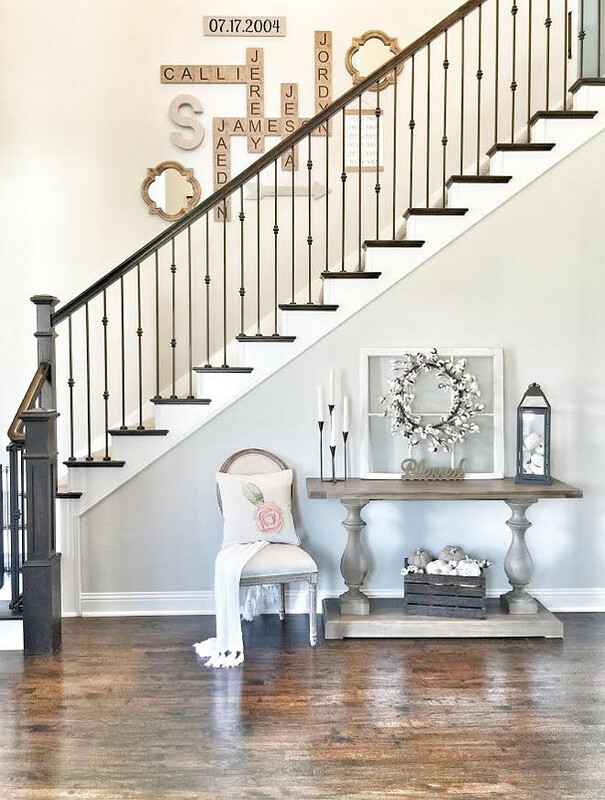 She is a young mom of four and she is shaking Instagram with her gorgeous home. I really couldn’t wait to share her home because I was sure you guys would love it as much as I do. Now, let’s read what she has to say! 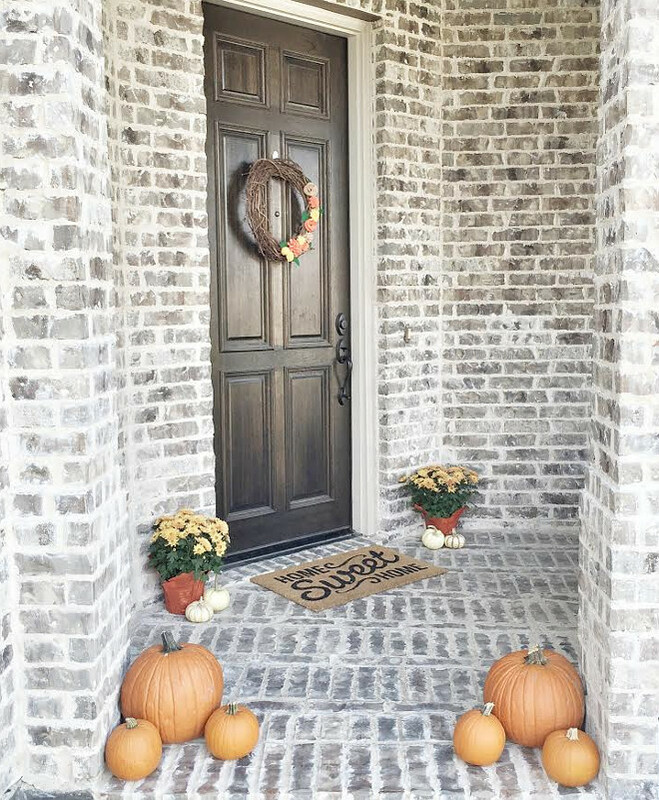 “My husband and I were originally from a small town right on the border of Texas and Oklahoma. We have known each other since kindergarten but didn’t start dating until our junior year of high school. After graduation we moved to the Dallas area for college and have stayed close ever since. We have been married for 12 years and have 4 beautiful children; a 14 year old daughter, an 11 year old daughter, a 7 year old son, and a 3 year old daughter. I feel very blessed to be able to stay at home with them. Our search for this home was an adventure to say the least. 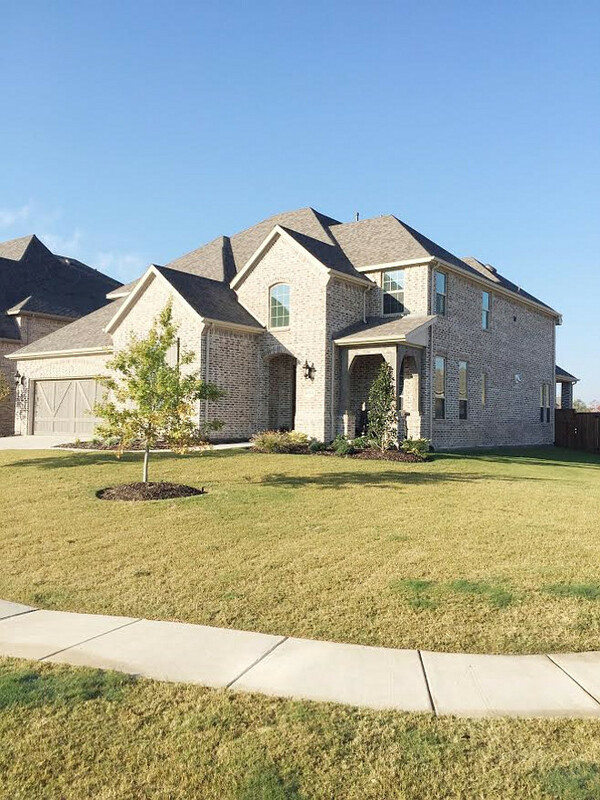 We sold our previous home in 2014 and signed contracts on 3 other new build homes before finally deciding on this one. 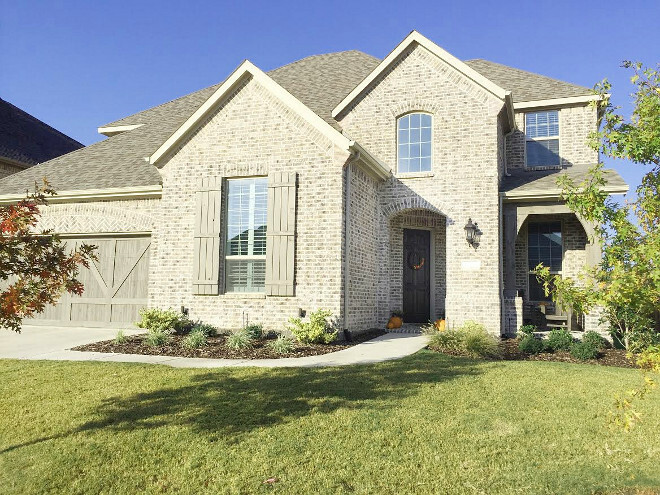 We even went through a 13 month build and backed out the month of closing. 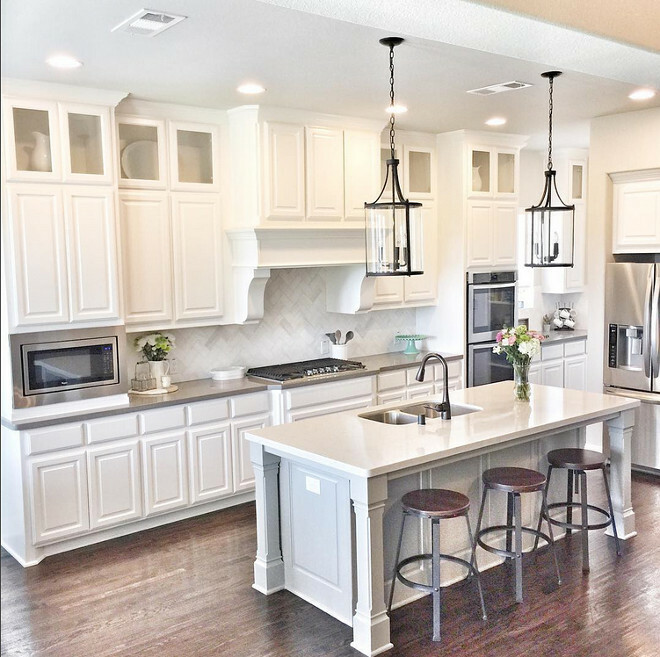 We fell in love with our neighborhood and our builder, Highland Homes, which had a great reputation for building a beautiful homes. It took another 8 months for them to build this home but it was all worth it. My husband and I chose all of the finishes for the house. While it was fun to pick out everything and really make it our style it was also a little stressful because you never know how things will turn out from a tiny color swatch, but I really couldn’t be happier with how it all came together. 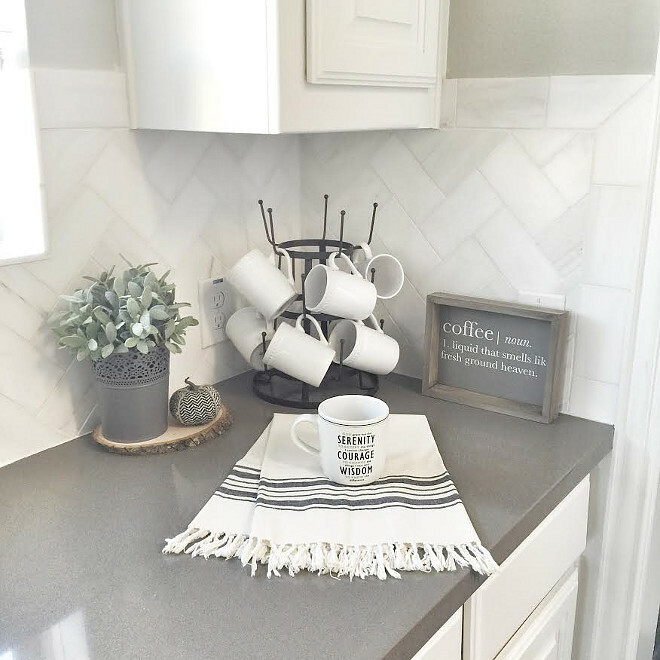 My favorite part of my home is the kitchen and I spent the most time choosing the finishes for this area and now we spend the most time gathered in this area as a family. 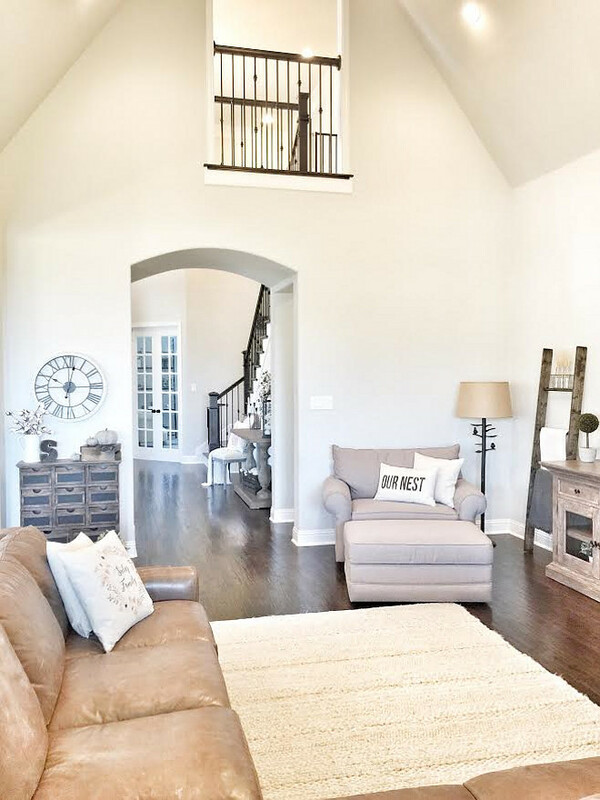 I’ve always loved to decorate my homes to really feel cozy and welcoming. I’m not really sure I have a specific design style. I just like what I like. 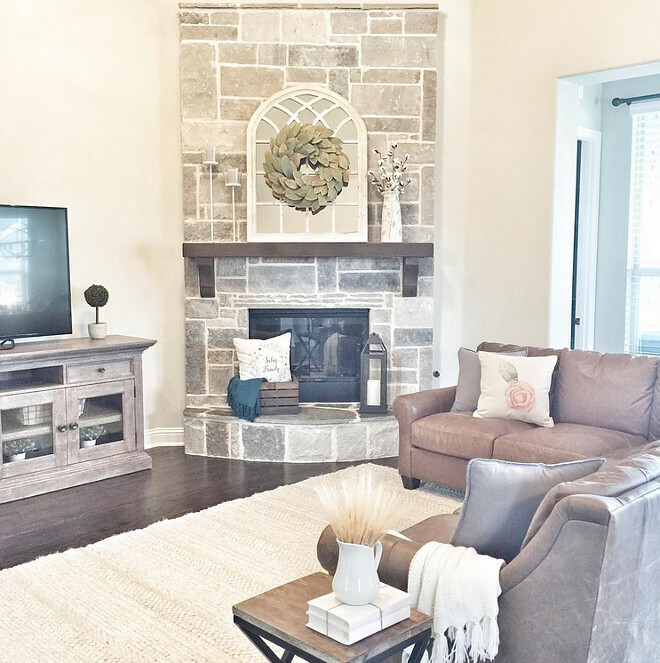 My home is a mix of modern, rustic, farmhouse and french country.” – Callie @ceshome6. 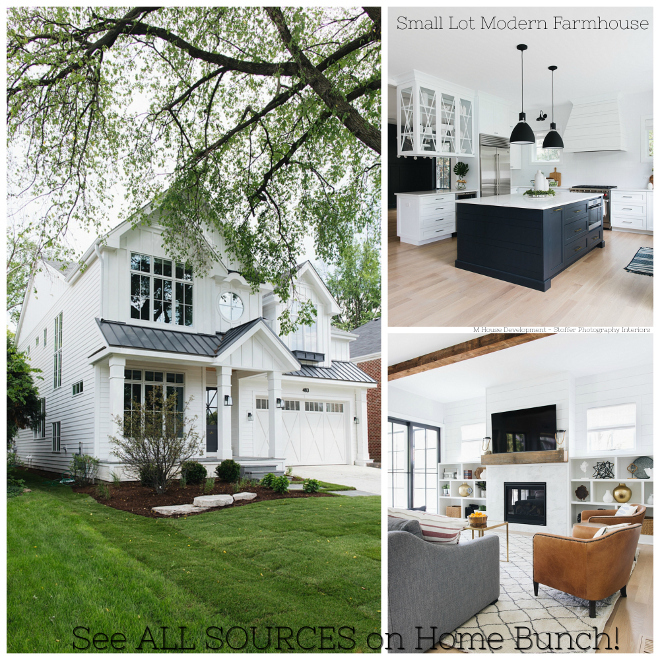 Home Exterior Details: Brick Exterior. Brick: Boral Sheltered Bluff. Mortar: Buff messy un-raked. Garage Door & Shutters: This home features Cedar garage doors, cedar shutters and cedar porch posts. Stain Color: Custom Highland Builder Color (RST #55). Front Door Stain: Royal Walnut. What a welcoming home! 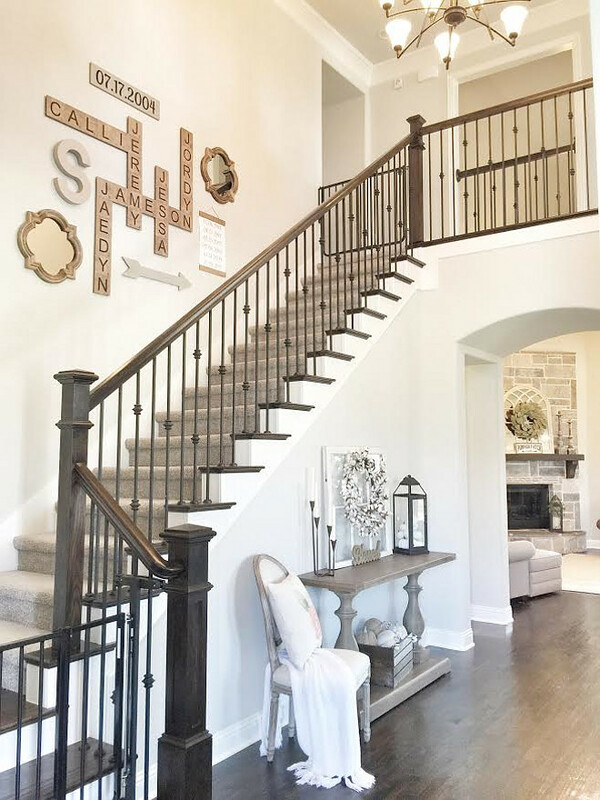 The dark stained staircase bannister, hand rails and treads color is Espresso, applied twice. Wall paint is Sherwin Williams Repose Gray. All trim paint in the house is Sherwin Williams Pure White. Decor: Console table – RH 17th C. Monastery Console Table in Grey Acacia – similar here. 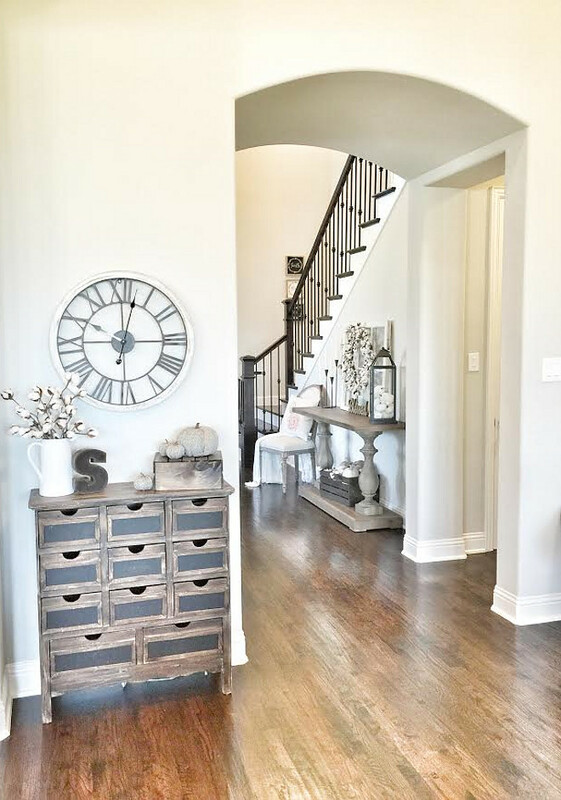 As you enter in to the home the formal dining is the first room you notice. We decided to add double crown molding in the formal dining and paint the walls a darker color to make it feel more formal. Lighting: Lighting is Quorum International Kaufmann Oiled Bronze. Dining Table: Restoration Hardware 17th C. Monastery Rectangular Dining Table in Brown Acacia – similar here. 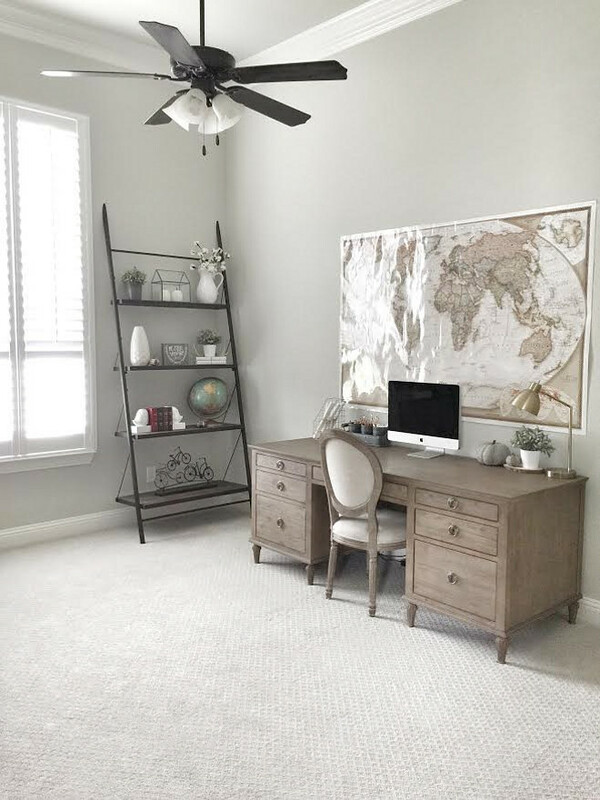 Rug: Nebraska Furniture Mart- Dalyn Rug Company Monaco Sisal Linen 8 x 10 – similar here. Linen Chairs: RH Vintage French Round Fabric side chair in Burnt Oak with Belgium Linen Sand – similar here & here. Wall color is Sherwin Williams Dorian Gray. My favorite piece in my home is this display cabinet that my husband surprised me with for our Anniversary/my birthday this year! 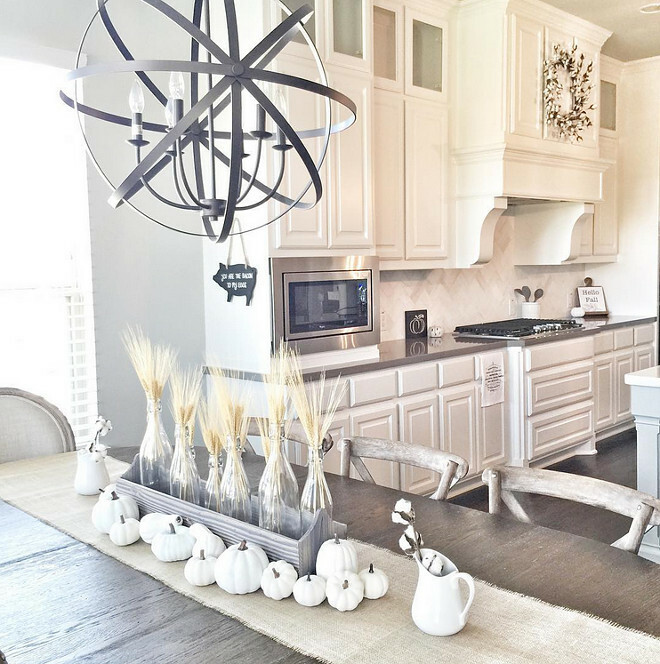 I love cotton, white pumpkins, and burlap for fall decorating. Cabinet: Universal Furniture Bannister Display Cabinet – similar here. 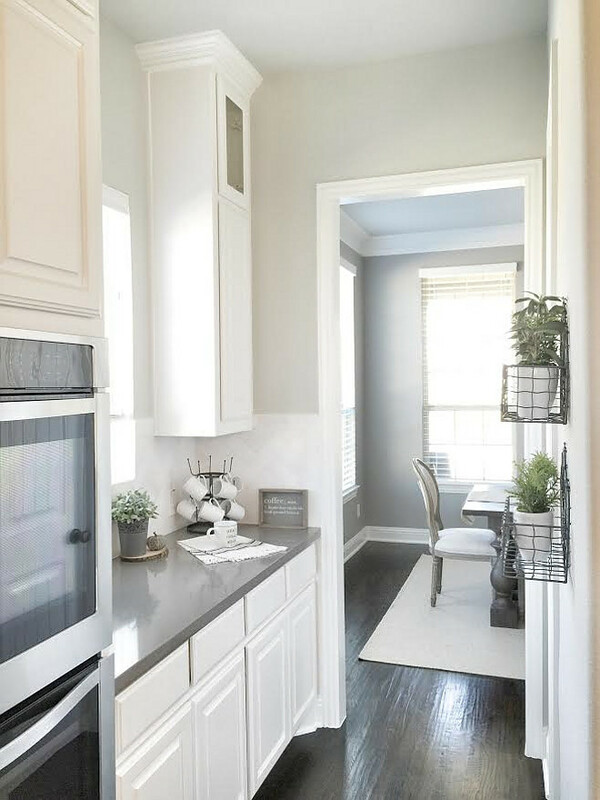 A butler’s pantry, with white cabinets and very dark hardwood floors, connect the dining room to the kitchen. Floors are 2 1/2 red oak planks hand-scraped lightly with the grain and stained Espresso twice. 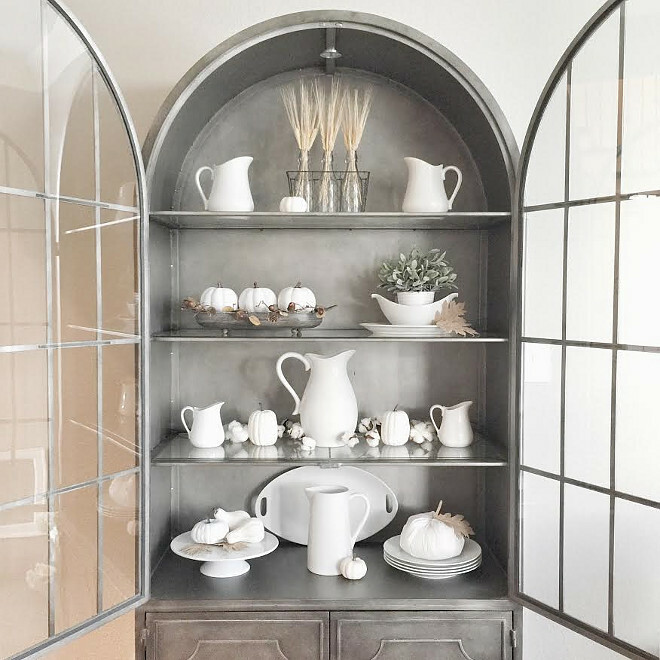 Isn’t this butler’s pantry a great place to prepare your morning coffee? Countertop is Grey Expo Silestone Quartz 4 cm square edge. 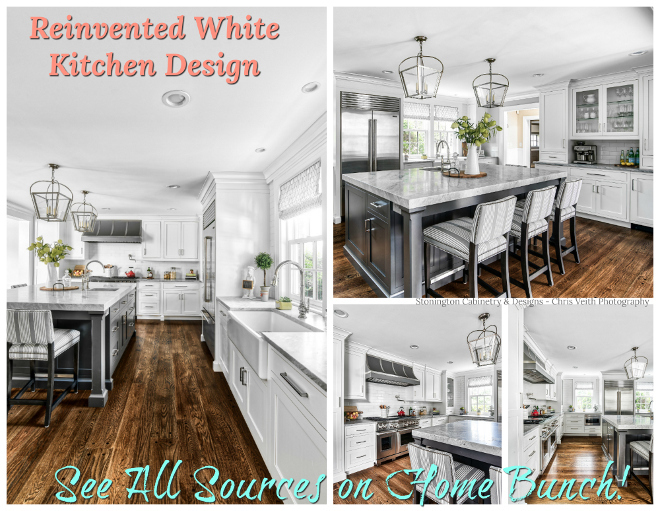 The butler’s pantry opens directly to a large white kitchen with grey island. 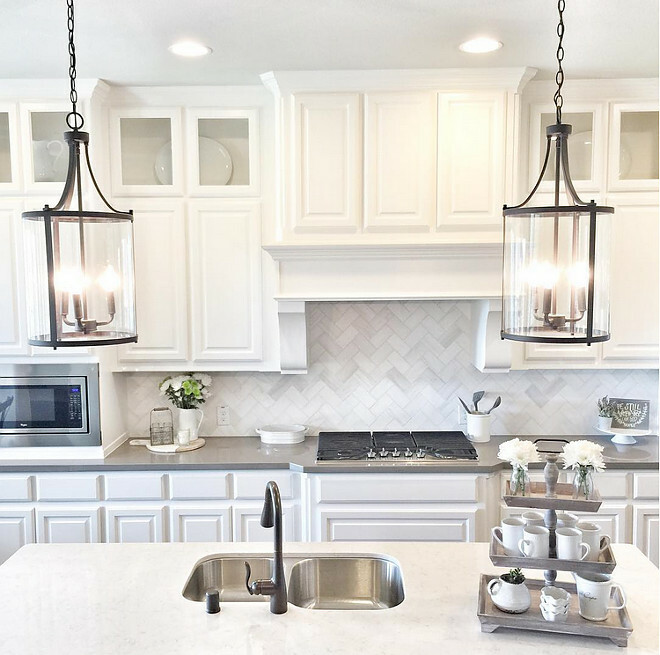 Kitchen lighting is Joss & Main Abigail Pendants. 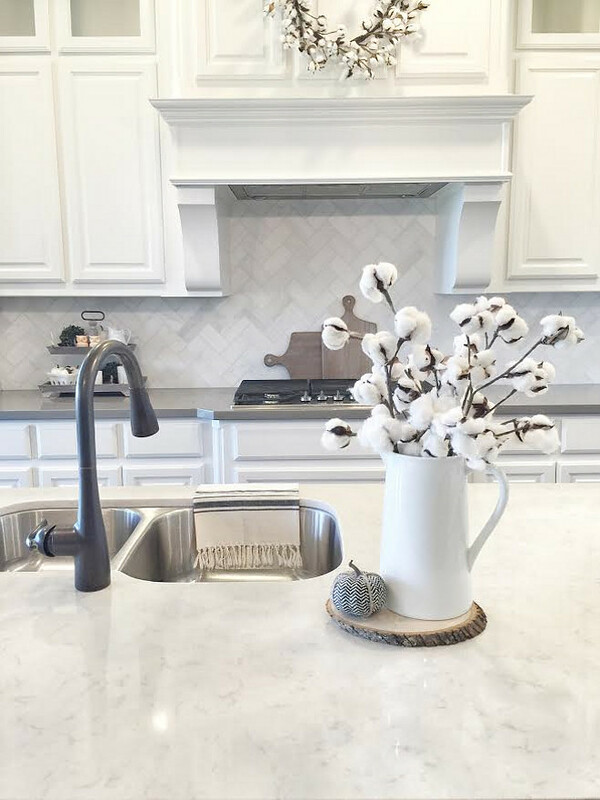 Island countertop is Lagoon Silestone Quartz 4 cm square edge. Kitchen Faucet: Moen oil rubbed bronze faucet. 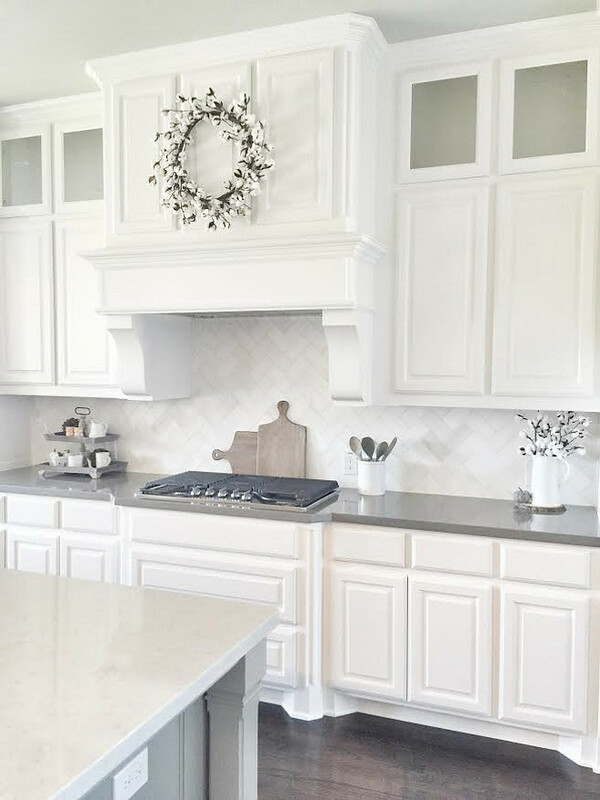 Backsplash is Daltile M313 Contempo White Marble Honed 3×6 Herringbone with #381 Bright White grout. 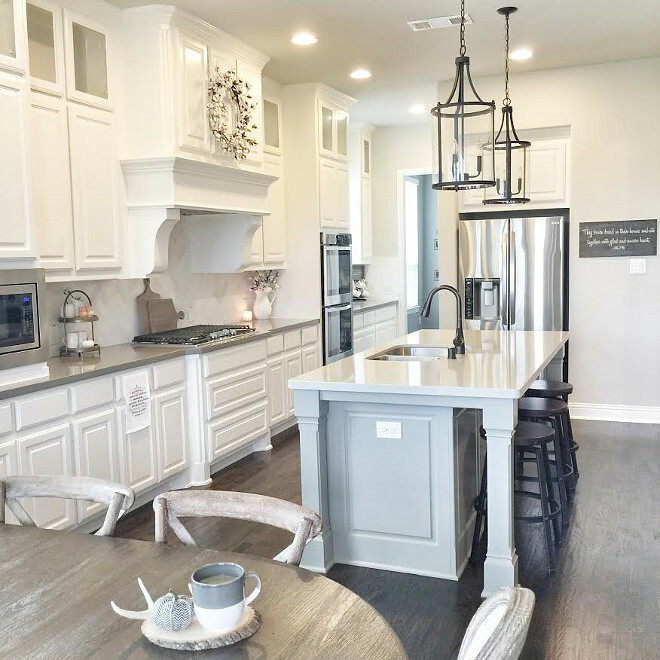 Island paint color is Sherwin Williams Dorian Gray. 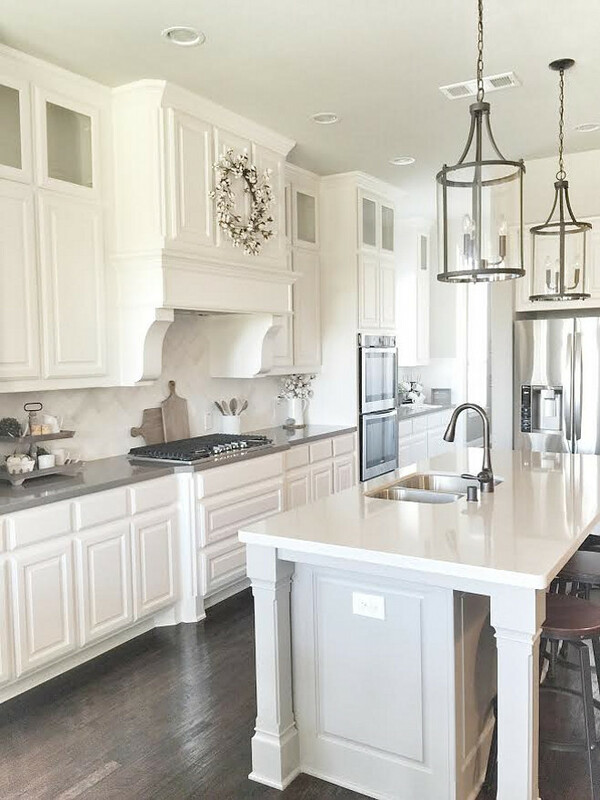 Paint grade custom cabinets painted Sherwin Williams Pure White. Callie is very talented! She even painted this “Thankful” sign herself. Kitchen nook round light: Quorum International Celeste 6 light Sphere ORB. Surrounding countertop is Grey Expo Silestone Quartz 4 cm square edge. 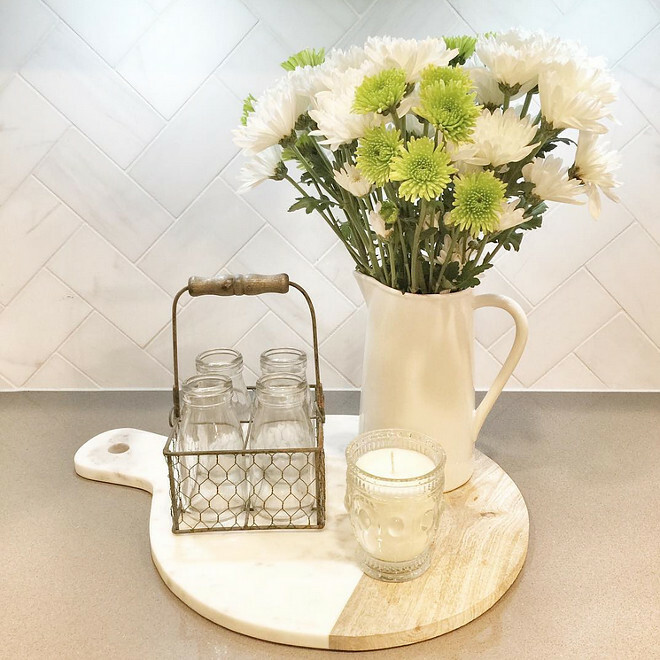 Two-tier tray is from World Market. Island size 8 feet by 3 1/2 feet. 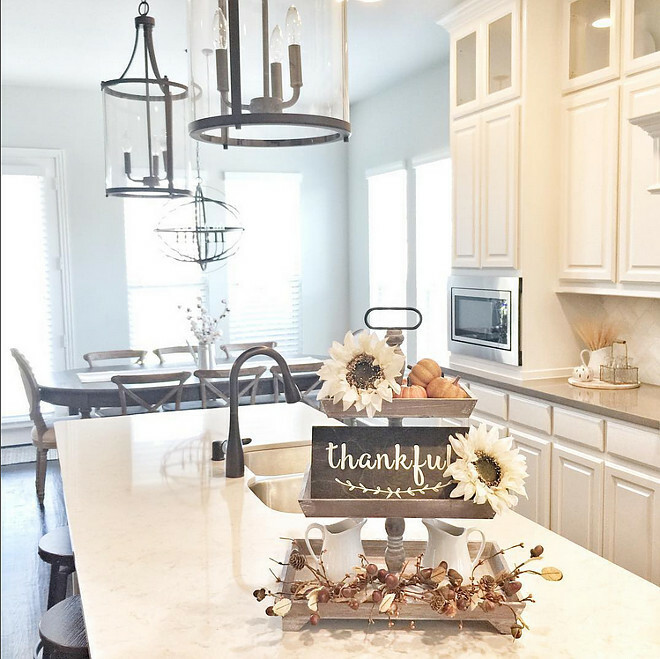 Beautiful decor can be found everywhere in this house. 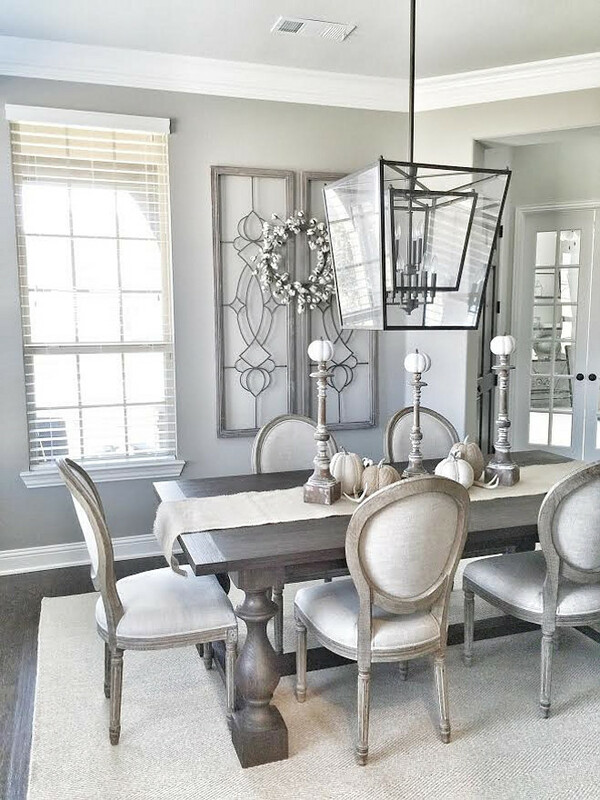 Kitchen Table: Restoration Hardware Vintage French Fluted-leg extension dining table in Brown Oak Drifted 92 inches. Linen Chairs: RH Vintage French Round Fabric side chair in Burnt Oak with Belgium Linen Sand – similar here. X-back Chairs: RH Madeleine side chair in Burnt Oak – similar here. 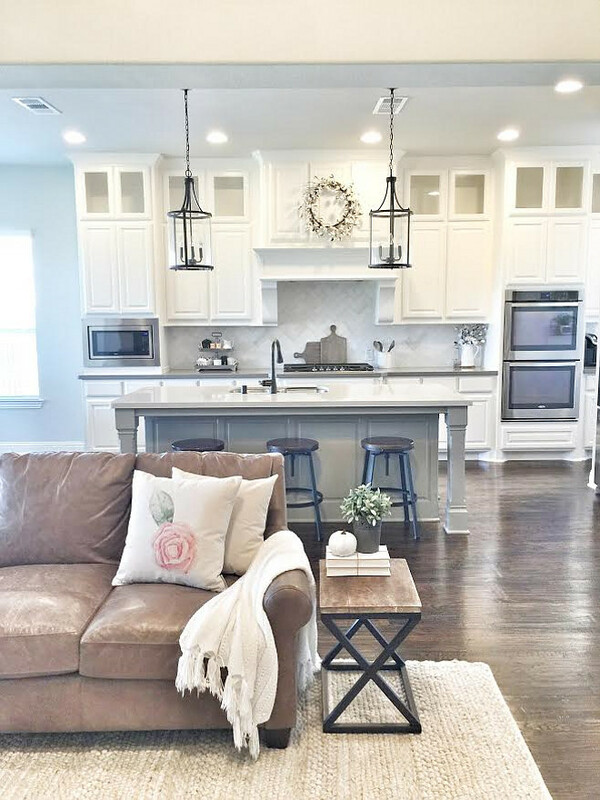 The kitchen opens to a cozy and warm living room. 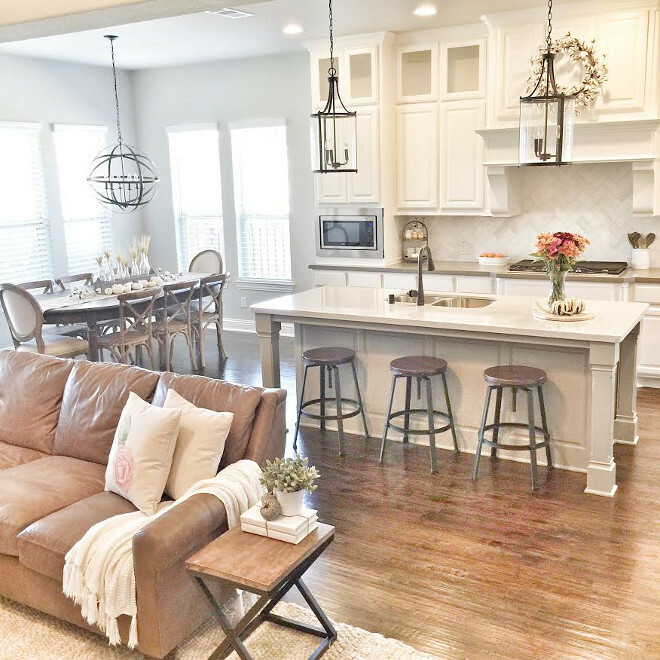 What I loved most about this home when choosing the floor-plan was the open kitchen/living area and the tall 2 story ceilings in the living room. I love how inviting this entire space feels. 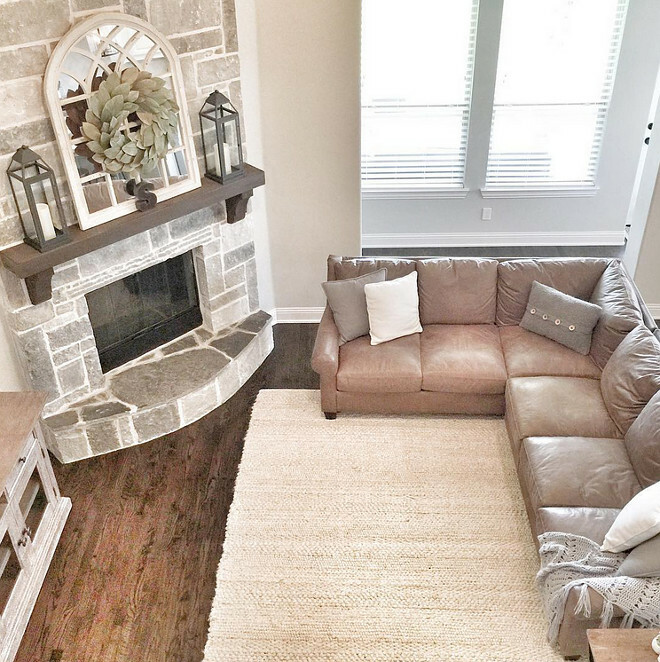 The leather sectional is Bassett Furniture Ellery L-shaped sectional in Stone. Fireplace mirror is Kirklands. The fireplace mantel is Cedar stained in espresso. Rug is Bassett Furniture Tahoe Wool Rug 8 x 10 in Cream – similar here. 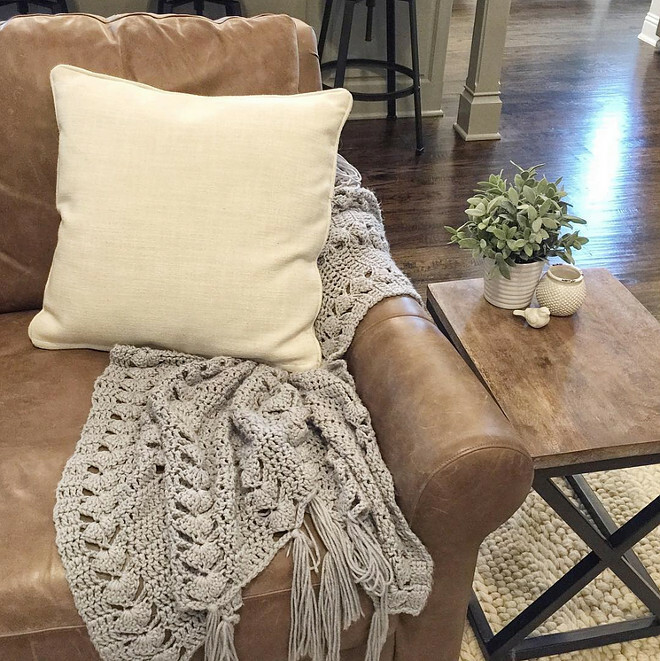 This throw is extra special to Callie because her grandmother made it for her. Side table is from At Home. 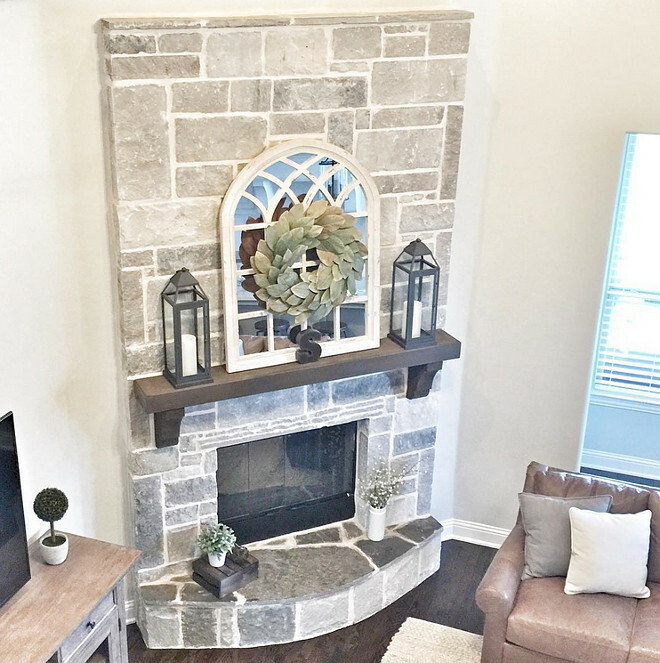 Fireplace stone is Smoked Leuders Chopped Stone with cream mortar. 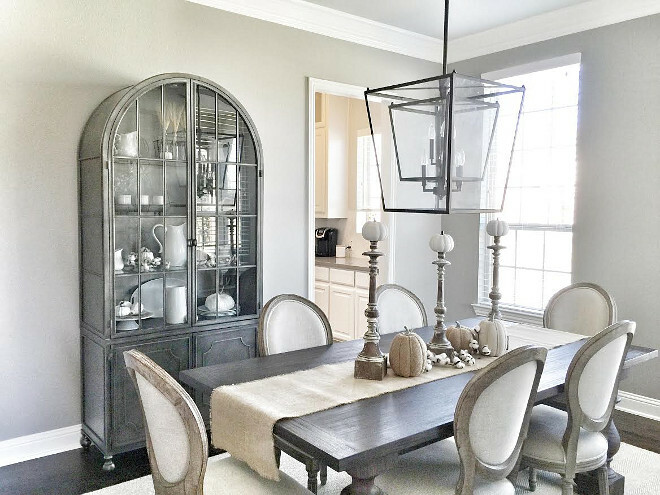 Wall Color: Sherwin Williams Repose Gray. Chair: Bassett Furniture Alex chair and a half with the Alex storage ottoman in Stone. 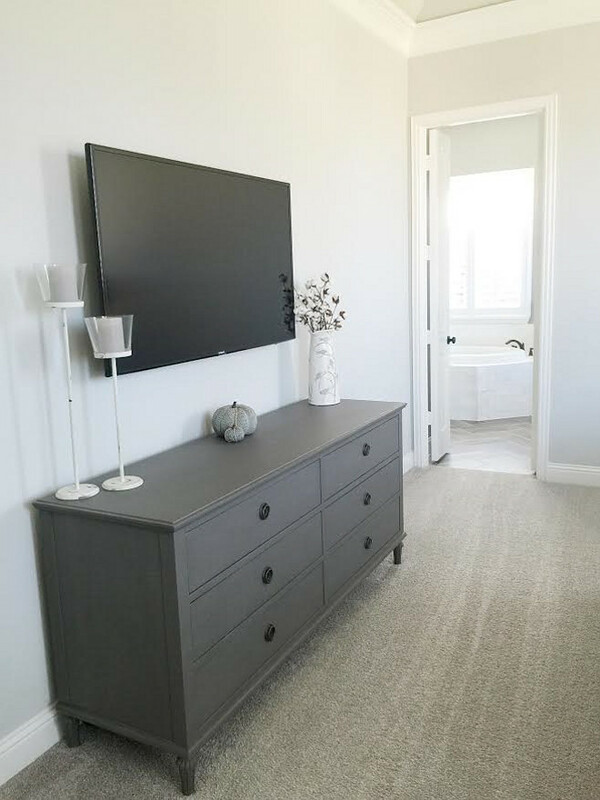 Credenza: Bassett Furniture Emporium 92″ in Compass Northern Grey. Blanket Ladder: Made by the homeowner. 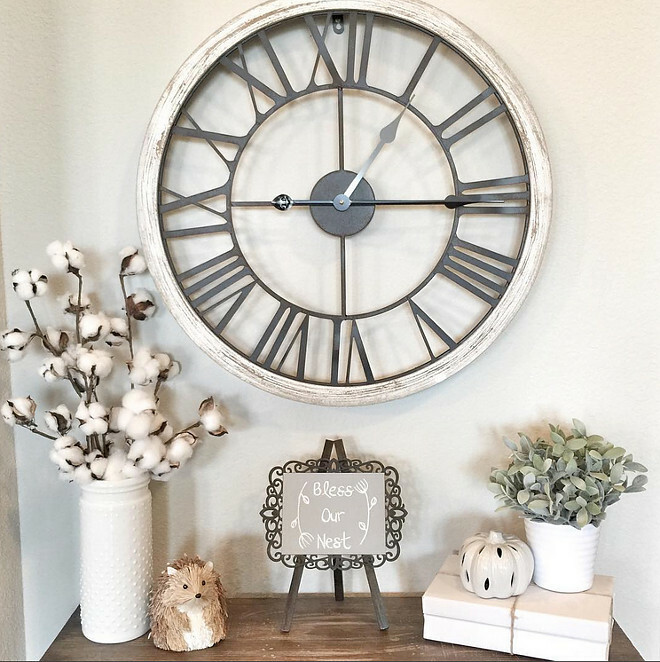 The chalkboard table is from Hobby Lobby. I love how large and open the study feels. 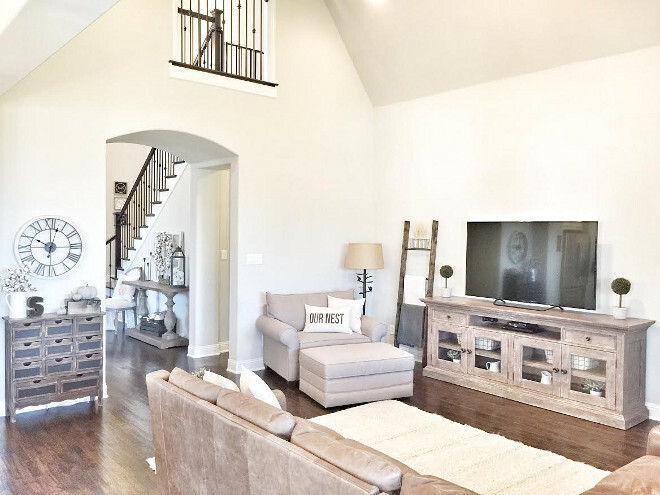 We decided to go with 3 1/2″ Plantation shutters in this room because the window is so large instead of the wood blinds like the rest of the home. Shelves: Restoration Hardware Reclaimed Elm and Iron metal leaner shelves in Rust. Wall color is Sherwin Williams Repose Gray. Carpet is Pergola #919 Penthouse. 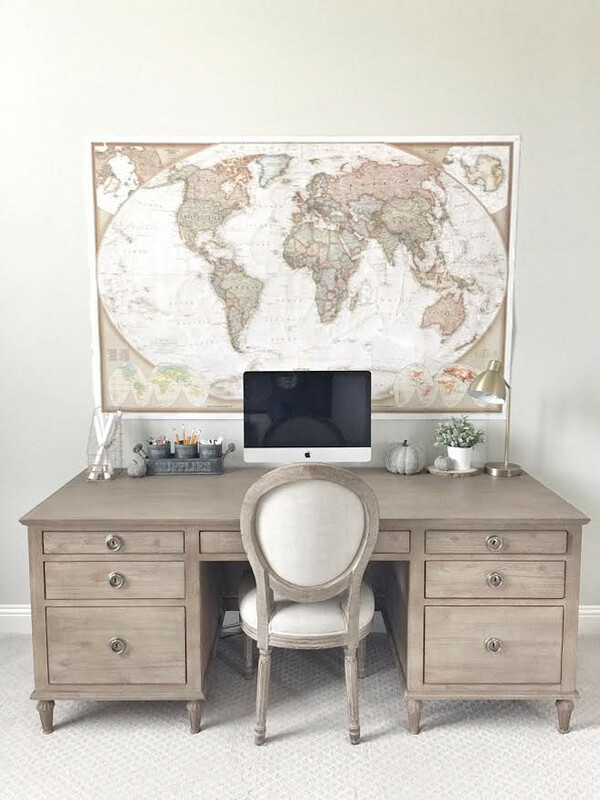 Desk is Restoration Hardware Maison Desk in Antiqued Coffee. Settee is from World Market. 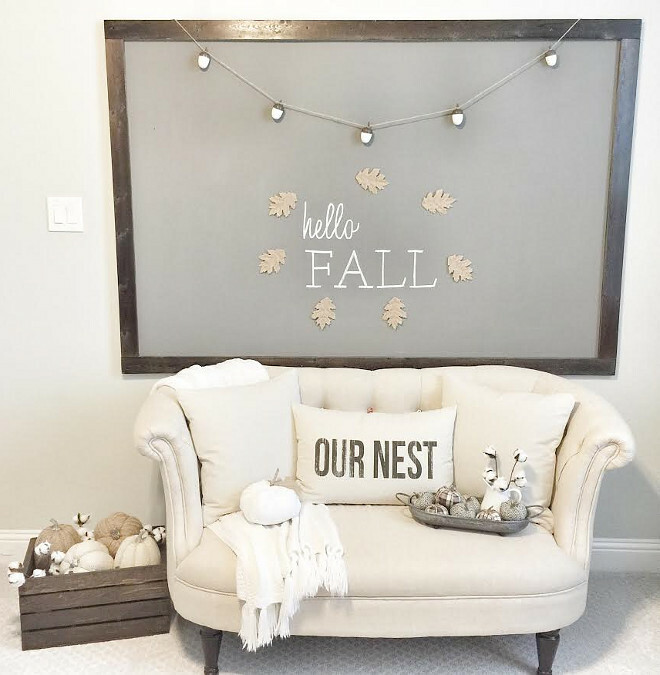 Chalkboard: Made by the homeowner. Bed Set: Bassett Furniture Ava Collection. Shower Curtain & Rug: Target. I love how large, open, and bright our bedroom is. It has a very calming feel. I got lucky with the bed and 2 side tables because I found them at a Restoration Hardware warehouse sale in perfect condition for a steal! The downside was that they were being discontinued so there wasn’t a matching dresser. 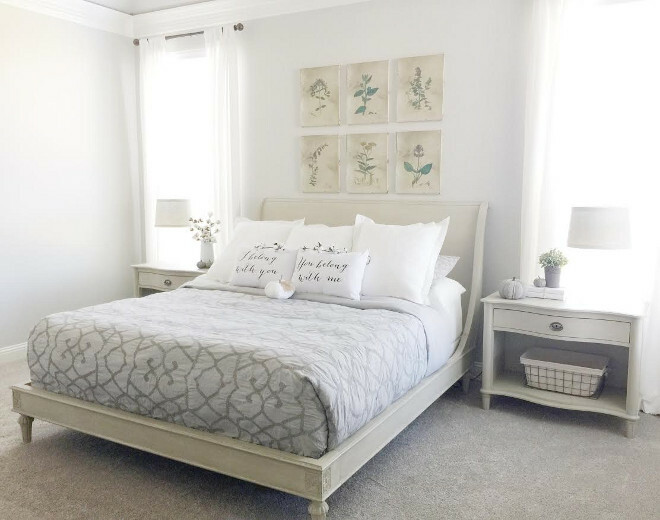 We decided to go with a darker gray dresser from Restoration Hardware in a similar line as the bed and purchase a grey comforter to tie each side of the room together. 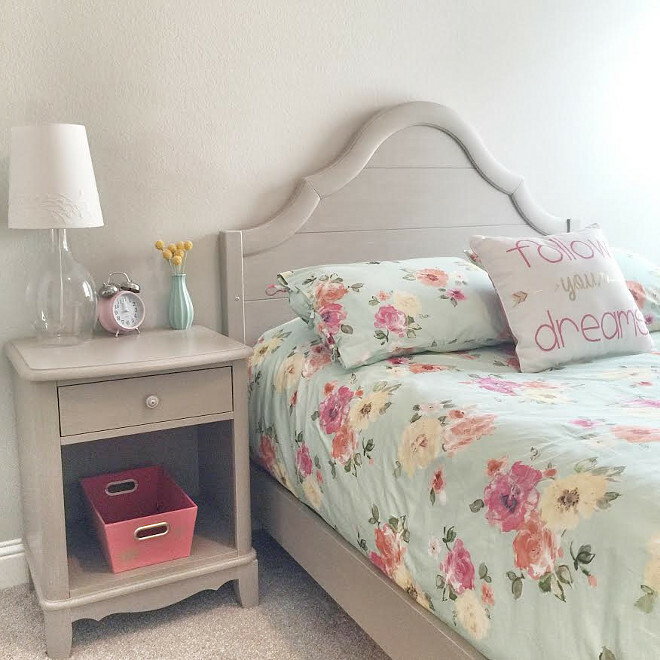 Bed, side tables and dresser: Restoration Hardware. Bedroom Wall Color: SW Repose Gray. My husband and I love watching movies together so a tv in our bedroom was a must. Carpet: Rio #404 Dusty Gray. 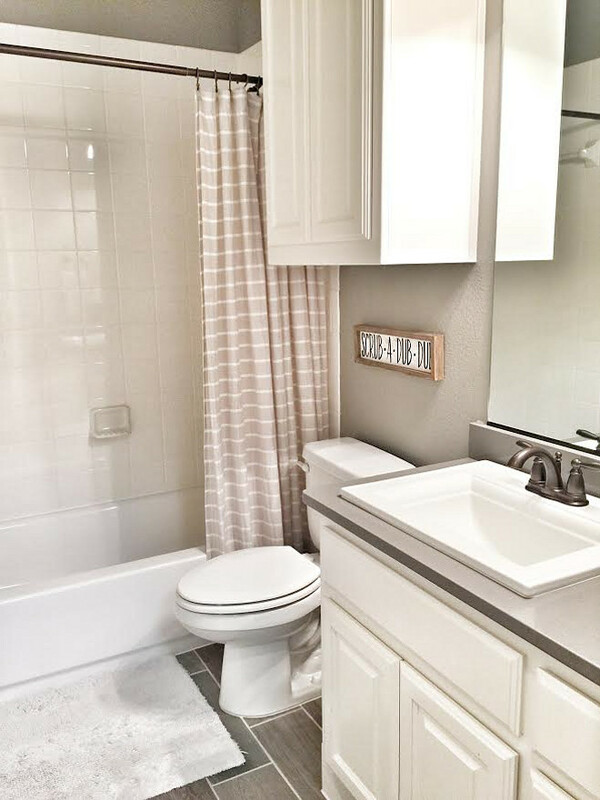 My master bathroom was the hardest area for me to design. 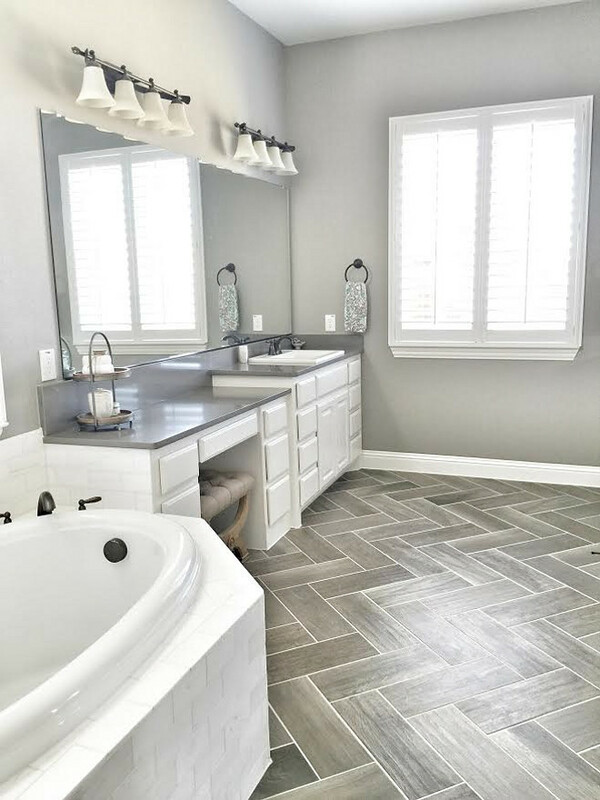 I really loved these gray wood looking tiles in a herringbone pattern for the floors but had no idea what tile to pick for the tub surround. 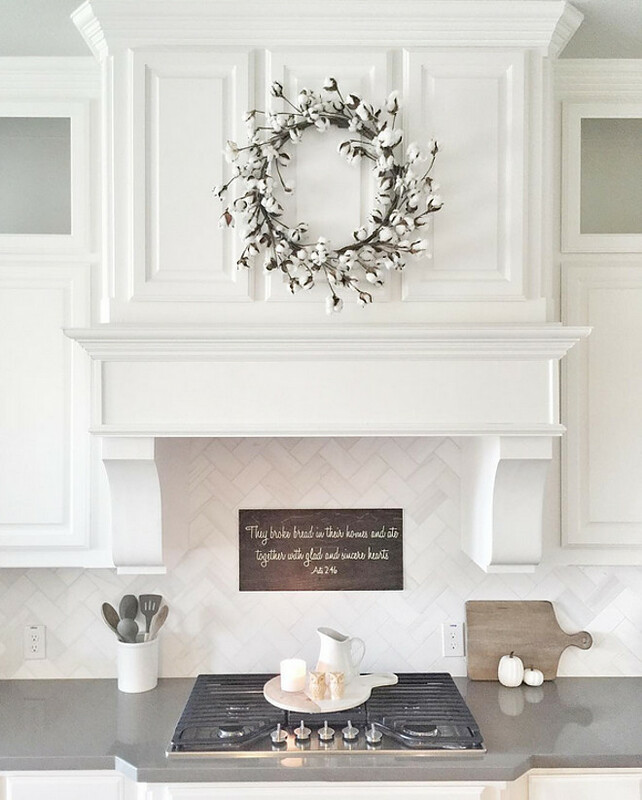 I’m not joking, I went to the design center 6 times before I finally decided on the same marble tile that we used for our kitchen backsplash. I couldn’t be happier with how the final product turned out. 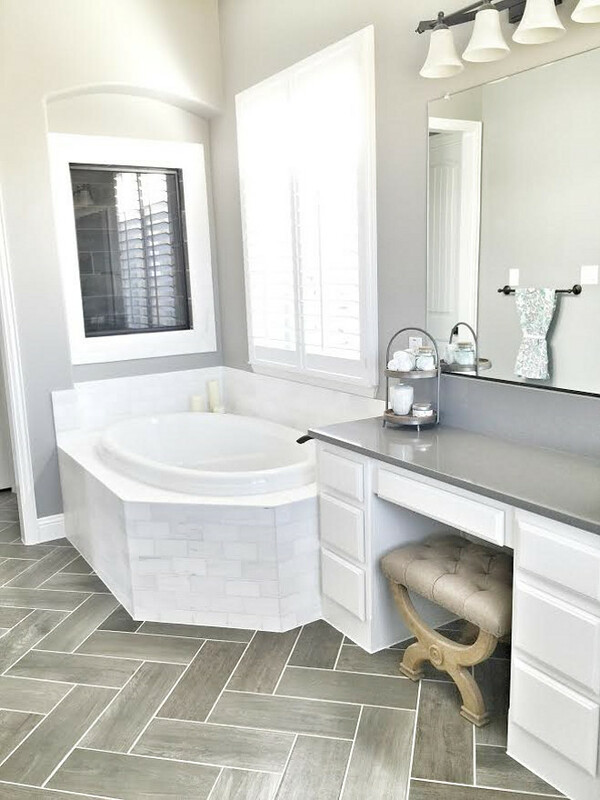 Bathroom tile floor is Daltile EMSLEM EM03 Gray 7×20 (similar here) laid Herringbone with #386 Oyster Gray grout. Bathroom cabinet paint color is SW Pure White. Bathroom wall color is SW Dorian Gray. Bathroom Windows: 3 1/2″ wood plantation shutters. 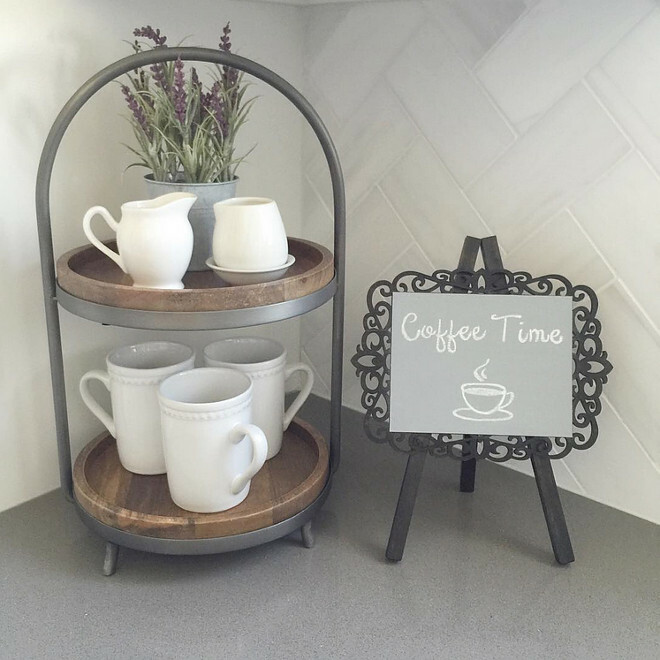 Tub surround tile is Daltile M313 Contempo White Honed Marble with Bright White grout. Bathroom countertop is Silestone Quartz Grey Expo. 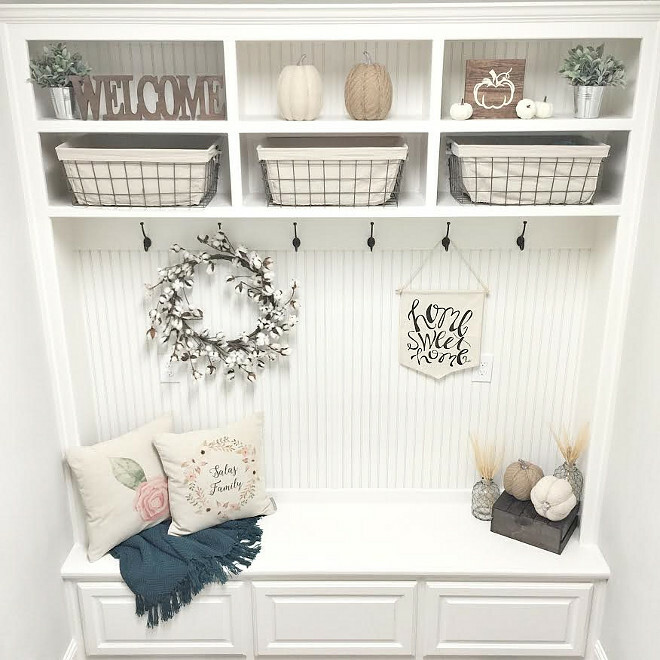 This mudroom bench was a last minute add on during our build and I couldn’t imagine this space without it. It holds all our summer towels, shoes, jackets, and backpacks. Painted in SW Pure White. 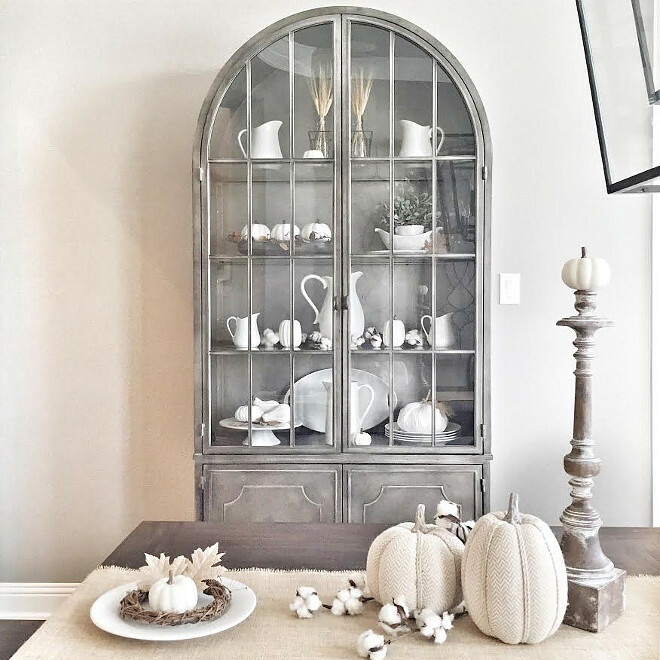 Make sure to follow Callie from @ceshome6 on Instagram to see more photos of her beautiful home! Serena & Lily: New Spring Arrivals! 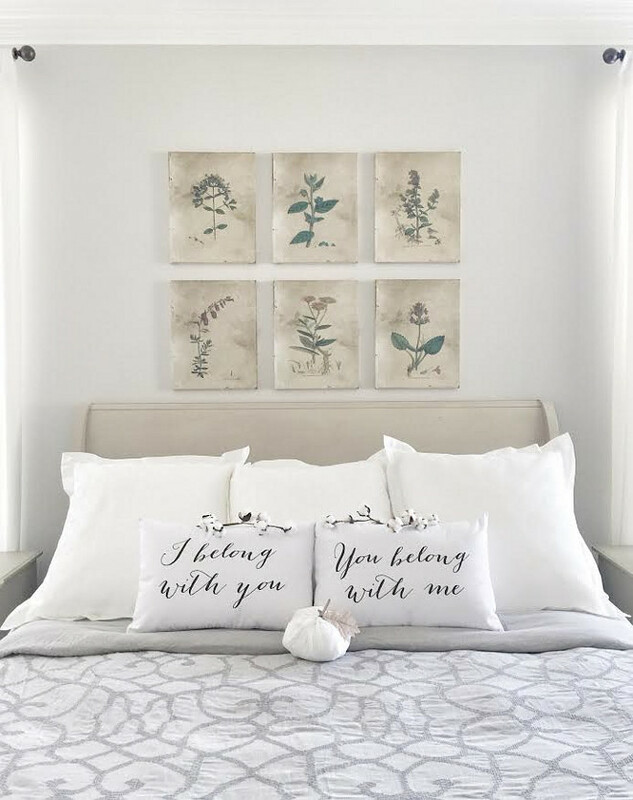 Gorgeous Pillows, Bedding & Rugs! This is a nice series Luciane. Real homes that people have created and actually live in. 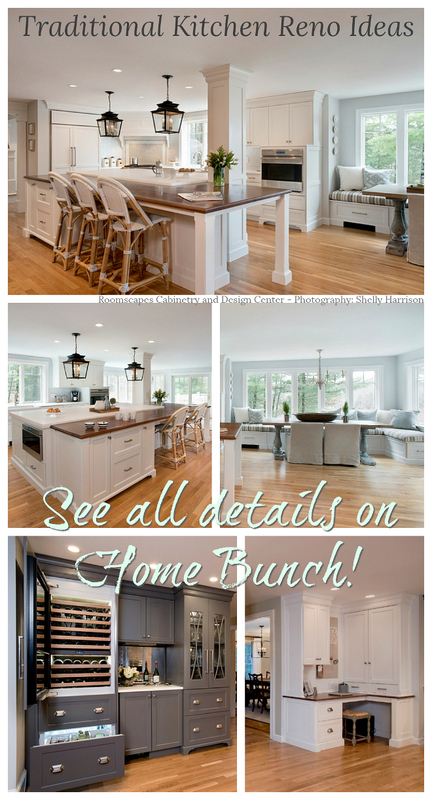 Many times when I am looking at interiors it feels like they are just show houses and not really occupied. 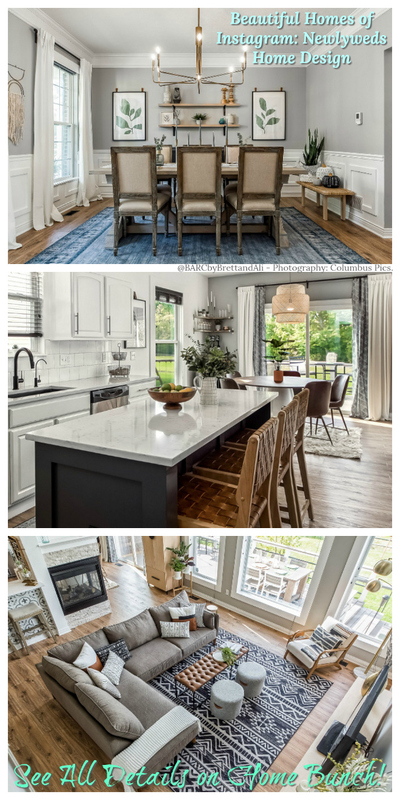 What exact floors were used in this home? 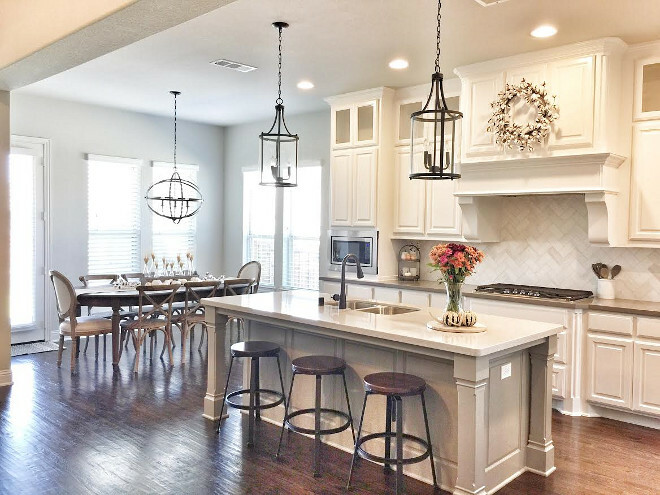 Where are the kitchen stools from? I just love them! what floors did you use in the house? Looks great!